There’s a certain time of evening at Kennywood Park, just when the lights come on, that the sky turns dusky blue and the clouds shimmer with hues stolen from the sun. The same sky has been over Kennywood since its opening in 1898, although with the ground-level park activities, not many people take time to glance upward. Linda, who is left-handed, works right to left, top to bottom, to keep from smearing the chalk pastels, which she likes because of their blending qualities. After making a sketch she begins to paint on the colors, starting with the sky. The Green Tree resident uses lighting and intensity to capture the scenes in photo-like color. “I like to paint in such a way that it looks like it’s coming off the paper,” she says. The series started in 1995 with “Ride with Me on the Carousel,” followed by “Making Memories at Noah’s Ark” in 1996 and “Coasting through Kennywood” in 1997. The Carousel and Coasting paintings still have some prints left, but the Noah’s Ark edition has sold out. Like others in her series, the limited edition painting will have 500 prints and 50 artist’s proofs. The carousel painting had 750 prints. To decide in what order to do the Kennywood scenes, she sat down with Ms. Rosenmeyer and the publisher of the series, Denny Oliver of Black Swan Gallery, to brainstorm. Noah’s Ark coincided with the renovations at the ride and “Coasting through Kennywood” was released the year the Racer, Kennywood’s twin coaster was refurbished. Linda’s latest painting was chosen for Kennywood’s 100th birthday because the Old Mill is the oldest ride at the park. Also, the sign on the Turnpike carries a birthday message, which commemorates the park’s centennial. She plans to debut the painting in late June at the Black Swan Gallery in Carnegie. Linda says it was a toss-up whether to end the series next year with Kiddieland or the Thunderbolt. After meeting members of Association of Coaster Enthusiasts last year, she made the decision. “The Thunderbolt won out. I admire ACE members for being able to ride the coaster; I’m a wimp when it comes to that.” She will include the Potato Patch in the foreground. A man who’s image she included in her carousel painting told her it was his “favorite ride.” Putting real people in her paintings isn’t always easy. To get the right positions for people rowing boats in the Kennywood lagoon, she posed family friends Mike and Jean Migliozzi outside in lawn chains with their two children. Kristen and Leighann. Linda stuck a rake and broom in Migliozzi’s hands to simulate boat oars. The sight was not any funnier than another couple sitting inside on dining room chairs with the man holding tennis rackets in a similar fashion. She snapped photographs of both families and began preliminary sketches before starting on the actual “Coasting through Kennywood” painting last year. 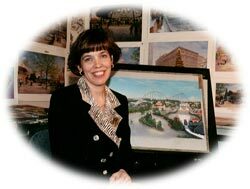 The nostalgic quality of her paintings appeals to Kennywood fans. Many are given as wedding presents and a number hang on walls in dentist’ offices, perhaps to put patients at ease. Her obvious affection for Kennywood shows in her work. But she is not a native Pittsburgher who grew to love the park at Kennywood picnics of during childhood visits. Linda grew up in Eddington, Pa., now Bensalem, northeast of Philadelphia. As a child, her artist talent was evident—a “blessing” that allowed her to show people she loved them. She met her future husband when her high school orchestra visited Bethel Park High School, where he went to school. After initial letter writing they lost touch until two years later, when he contacted her. He proposed to her on their third date—after a day at Kennywood. On their first anniversary, he felt a calling to leave his job as a salesman at AT&T and become a minister. When he finished seminary, they started a family. She became a stay-at-home mom with a portrait art career on the side. Her husband and children have been very supportive and patient with her artistic endeavors. She still has two more paintings in a series she started featuring Kennywood’s carousel mounts. She has done “The Spirited Pegasus,” the lead horse, and “Kennywood’s Black Knight.” Linda will finish the series with the lion and tiger, the only two animals that are not horses. She also did a pen-and-ink conceptual sketch of Kennywood’s centennial midway. Because she was pleased with the result, she is considering a pen-and-ink series of the park. It’s something to contemplate while she demonstrates her talent during the park’s Grand Victorian Days on July 1 through 5. Her next undertaking is “A Holiday Tradition,” featuring the former downtown Pittsburgh Joseph Horne’s decorated with its famous corner Christmas tree in lights. She is using archival photographs for reference. The painting will be used by the American Cancer Society on its Christmas cards this year. Perhaps the most special painting she has done is “Meet Me Under the Kaufmann’s Clock, Too,” done to recall her husband’s family’s annual visits to see the windows at Christmas time. She included her in-laws, Jean and Tom Barnicott, and husband, Tom, and sister-in-law Terri as children. She painted the picture after Jean Barnicott was killed in an accident in 1991. As the elder Tom Barnicott recovered for 90 days in Allegheny General Hospital, he could see the steeple of a downtown church, which Linda included in her painting. She also added the 31 Sheridan/Elliott streetcar to honor the neighborhood where her husband’s church, Emanuel United Methodist, is located.